Champs Story and his companion CHAMP, The Golden Retriever, have been brought together to create the Cancer Companion Program. A program that utilizes companionship & education to advocate positive healing in those lives touched by childhood cancer, while also creating a unified voice whose mission will be to make ending cancer a national priority. The vision of this program is to Imagine a World Without Cancer. According the American Cancer Society, cancer prevention and control education that is provided as a part of comprehensive school health education nationwide will significantly reduce the risk of cancer for all Americans now and in the years to come. ASCEND’s Vision for Champs Story has already begun to unfold. With 4,000 schools nationwide signed up to receive Sylvan Dell E-Books, Champs Story will be available in English and Spanish to all of these schools. The program will “launch” in fall of 2010 starting in Charleston, SC and expand on a national level. 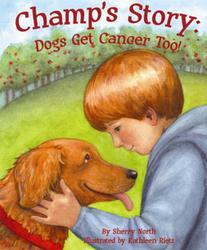 Goals & Objectives: “CC” is a stuffed golden retriever who is dressed with an arm band and collar to mirror the main character in Champ’s Story, which is his own story book that children can relate to, because Champ has Cancer too. a. Champs Story serves as a means to empower caregivers, teachers, and parents to discuss cancer with children in a way they can relate and understand. c. Intercedes as a form of expression to friends/classmates by helping the child to explain what is occurring in their bodies as a result of cancer. c. Tool for the caregiver to communicate treatment protocol while reducing fear and anxiety felt by both the child and the parents.